Filson, a Seattle-based manufacturer and outfitter, has opened the doors to its first Michigan store in Midtown Detroit today. The new store is located at 441 W. Canfield, on the same block as Shinola. The 1,100-square foot store features Filson’s “unfailing goods,” which include apparel, bags ,and accessories. Madden says Filson has been committed to manufacturing many of its products in America, with the best materials found from around the world, including Mackinaw Wool and oil finished Tin Cloth. He says while Filson’s history has its roots in cold-weather climates, the company recently introduced a new line of apparel that offers the functionality of Filson originals in lightweight, breathable fabrics that can be worn year round. Founded by C.C. Filson in 1897 to outfit prospectors headed for the Klondike Gold Rush, Filson became part of the same family of companies as Shinola in 2012. 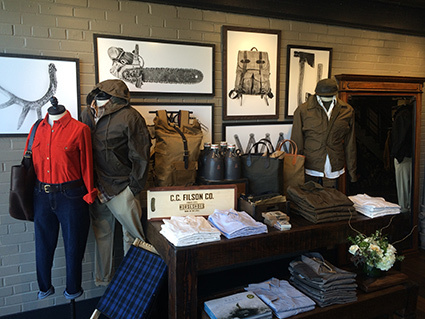 The Detroit store is Filson’s 10th retail store, with additional locations including Seattle, Minneapolis, New York, Portland, Washington, D.C., London, Dallas, and San Francisco. Shoppers are invited to enjoy live music between 1- 4 p.m. Saturday and Sunday for the opening.